Description: A map of the European Russia showing the territorial expansion between the death of Peter the Great (1725) to prior to the end of the reign of Catherine II (Catherine the Great) in 1796. 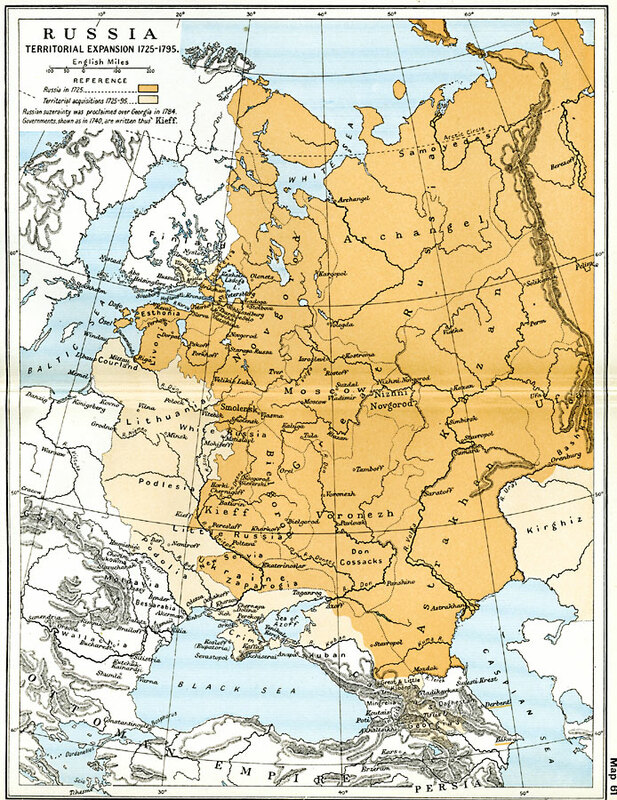 The map is color–coded to show the Russian territory in 1725, and the territories acquires between 1725 and 1795, including portions of Finland west of Carelia, Courland, Lithuania, western White Russia, Podlesia, Podolia and western Little Russia, Crimea and territory to the River Kuban, Kirghiz, and Georgia. The map notes Russian suzerainty proclaimed over Georgia in 1784, and the province governments shown as of 1740 in bold font. The map shows province boundaries of the period, major cities, rivers, and terrain features.